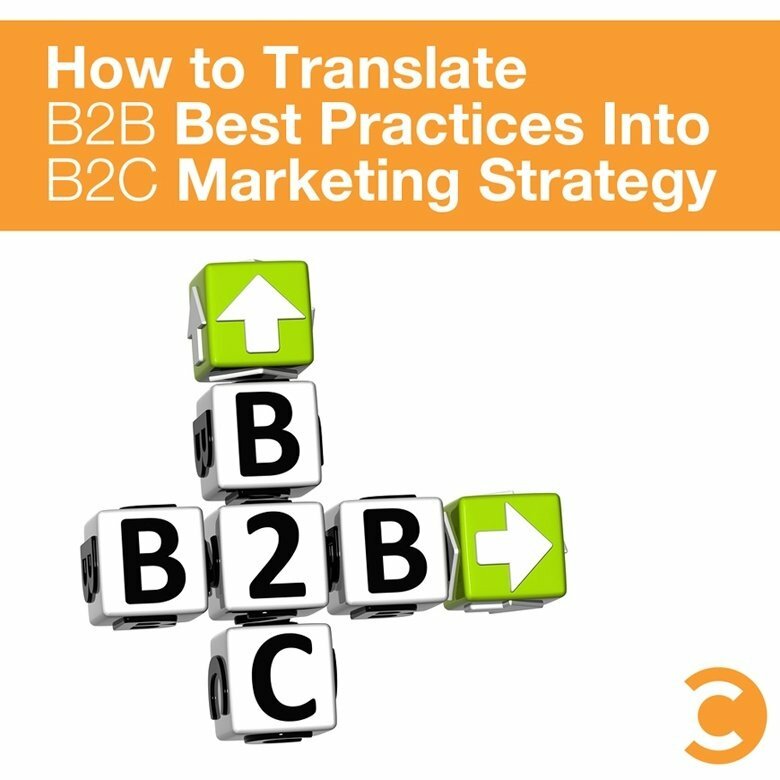 Ask marketers to compare B2B and B2C, and many will tell you they’re opposite sides of the same marketing coin. While that’s not a bad thing, most marketers tend to focus more on the difference than the uniting coin—and they can miss out on some valuable lessons by doing so. Take marketing technology, for example. Generally speaking, B2C teams don’t use CRM or sync up with their marketing automation systems as much as a B2B team will. One obvious reason is that the B2C lead life cycle is rarely as persistent and long as the B2B cycle. Many B2C marketers assume their campaigns only need to be useful or entertaining, and they leave the long engagement efforts to their B2B cousins. If this sounds familiar to you as a B2C marketer, consider stealing the tips below from the B2B playbook. A B2C marketer might email a personal inbox shared by a husband and a wife, while the B2B marketer will target a prospect’s work email. Obviously B2B has the advantage here, since they know they aren’t wasting resources on the wrong eyes. But often, they take this precision a step further by cleansing their data, eliminating duplicates, removing dead ends, and segmenting leads into extremely precise categories. As a B2C marketer, you can ensure your marketing automation campaigns pack maximum punch by doing the same. B2B teams spend considerable effort on mapping out buyer priorities, motivations, and pain points, right down to very detailed situational and behavioral characteristics. Through the right marketing technology, they can deliver a targeted message to a specific buyer at the perfect time. If your B2C team tends to rely on conventional demographics, try drilling down into your buyer qualities. Your messages will matter that much more to the lead viewing them. There’s rarely an inside sales team when targeting consumers, which tends to negate the concept of “qualification;” the customer is a customer or they aren’t. Sounds simple enough, but B2C teams can benefit from qualifying leads to decide how many resources they’re worth. Consider setting up a basic scoring model, like dividing leads into “hot, warm, and cold” categories based on behavior. You’ll have a much better idea of who’s worth extended effort and who isn’t. Skilled B2B marketers know buyers often need to contemplate making a purchase, which is why they use MA to coax leads through the buying journey. To nurture that initial spark of interest, teams create paths for future engagement, such as offering an incentive in exchange for information. The team then advertises to that lead with a variety of targeted campaigns that overcome their objections. If your B2C team can do the same, cart abandonment doesn’t have to be the end of the engagement—instead, you’ll keep marketing to that lead. Yes, B2C does this already, but B2B marketers tend to go much deeper, since they typically work through a longer approval chain before purchase. By skillfully anticipating and dismantling obstacles in advance, B2B teams keep the lead engaged until purchase becomes an obvious next step. Here’s what you can learn from this: Instead of simply assuming individuals will make a quick decision to buy or not buy, address objections up front and turn non-buyers into buyers. Marketing technology provides a wealth of data that points the way to ROI, which is why B2B teams track leads from the initial source to purchase. If your B2C team isn’t already measuring the activities that matter, start focusing on metrics now. Figuring out the best source of hot leads, rating your content performance, listening for new audiences, and understanding where and why you’re losing specific buyers will help you sculpt powerful campaigns. Often when B2C marketers do use marketing automation, they tend to use it only as an email platform. If that describes your team, get trained on how to use all of the system features, then develop strategies that take advantage of the platform’s full potential. You’ll see an exponentially greater impact. B2B marketing leaders are forever striving to align sales and marketing. While you may not have an internal sales counterpart, you do have staff on the showroom or store floor, the e-commerce team, as well as customer service reps, and those people can tell you exactly what customers think and why they convert. When it comes to marketing automation and CRM practices, your B2C team can easily accelerate ROI with a few new or expanded practices. Remember, the technology is there to make your marketing programs more efficient and powerful, and the results will roll in no matter what side of the coin you’re on.